Kidnappers of Rt. Rev Gabriel Adebanjo, the Bishop of the Lagos Central Diocese of the African Church and his wife have reduced the ransom to N20 million. They had started at N100 million. The couple was kidnapped in Delta State five days ago when they went to Warri for an adult harvest programme which was supposed to hold the day after they were kidnapped. The Bishop's driver was shot in the Kidnap process but he has since been stabilised and the bullets have been removed. According to a reprot in a newspaper, Saturday PUNCH, When the bishop took off from Lagos, he would have gone by flight but had to go to Ijebu-Ode, Ogun State, to pick his wife where she works and they decided to go by road. Adetona said that information they gathered from the driver was that when they got to Effurum Junction, a fire outbreak at a pipeline that had just been vandalised necessitated the diversion of traffic. “They had to take another route. On their way, they stopped over at a party organised by a member of the House of Representatives. They had just left the gathering when they were kidnapped and the driver was shot in the hand and leg,” he said. The kidnappers were said to have cornered the couple’s car along Adagbarasa Road as they were approaching Eku Osubi Road. While shooting sporadically in the air, they took control of the bishop’s official car, a Toyota Avensis, and sped off with the couple in it. Saturday PUNCH learnt that the vehicle was later abandoned many kilometres away after the kidnappers transferred them into another vehicle. Church officials say they believe the bishop was a target of opportunity for the kidnappers, who might have had an informant at the gathering to tell them that someone important was in attendance. 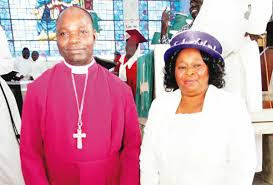 Bishop Adebanjo, a native of Ijebu-Mushin, Ogun State, was said to have been transferred to the Lagos Central Diocese about three months ago from the Ikot Ekpene diocese which he was previously heading.